WERE YOU INJURED OR DID A LOVED ONE DIE IN A NYC BUS ACCIDENT? Every year, thousands of people are killed or sustain serious injuries in accidents involving buses. Tragically, many of these accidents are the result of negligent bus drivers and their employers. These accidents can result from poor driving, including the failure to yield the right of way to pedestrians, vehicles, bicyclists, as well as other violations of the relevant vehicle and traffic laws. Some accidents also involve the failure to properly maintain and/or equip the involved bus. In bus accident cases, it is imperative to be fully knowledgeable as to the type of bus involved in the accident and the equipment installed in the bus. For example, in most cross country tour buses, the buses are installed with video cameras. These cameras not only show the road ahead but the driver as well. It is therefore crucial that the attorney investigates the bus involved in the accident to determine whether such video cameras were installed. A demand for production of videos must be made upon the defendant bus attorneys. A deposition of the defendant bus driver should never be taken until the videos are produced. In a recent case involving a cross country tour bus, our NYC bus accident attorneys demanded the videos. They were finally produced on the eve of the deposition. The videos clearly showed the bus driver not looking at the roadway and going through a red light prior to striking a bicyclist who was attempting to cross the street at the crosswalk. Following the cross examination at the deposition of the bus driver with regard to the video, the defendant conceded liability. The case was settled for $1.4 million despite the fact that the injured plaintiff had made a full recovery. The video that was produced can be seen on the right. To read a transcript of the deposition of the defendant bus driver click here. For a case to be successfully prosecuted, it is paramount for the victim or his or her family or loved one to choose a New York bus accident attorney with an intimate knowledge of the laws and rules affecting buses. Additionally, comprehensive knowledge of the Federal Motor Vehicle Standards, the Smith Method of Driving and the internal Rules and Regulations of each of the bus companies is essential. The driver disciplinary process is also unique as are the standards for admission of reports done by the applicable public safety boards. 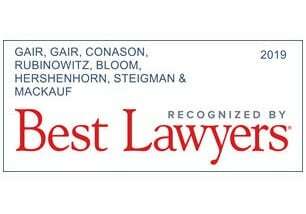 In order to ensure important eyewitnesses are located, drivers interviewed, and physical evidence preserved, the NYC bus accident attorneys at Gair, Gair, Conason, Rubinowitz, Bloom, Hershenhorn, Steigman & Mackauf initiates an independent investigation process as soon as possible when seeking damages for a bus accident. If necessary, we also retain expert accountants and financial analysts because many bus accident cases have their own set of associated losses including lost wages, the cost of care and many other monetary costs. In order to accurately assess what these costs will be for the remainder of a victim’s life, we use financial professionals to derive fair resolutions for injury victims. $27,500,000 verdict for a female pedestrian struck by an MTA bus, resulting in the loss of her leg. This is the largest verdict for such an injury in New York State history. $12,000000 settlement for a bicyclist struck and run over by an MTA bus. $10,000,000 settlement for a legally blind 51 year old woman struck by a bus while waiting at the Hempstead bus terminal. $7,000,000 settlement for a 68 year old New Jersey man who was struck by a Town of Parsippany bus while he was crossing the street. $4,000,000 settlement in a New York Personal injury case in which a young woman was crossing the a New York City street when she was struck by a New York City Transit Authority bus. The New York bus accident attorneys at Gair, Gair, Conason, Rubinowitz, Bloom, Hershenhorn, Steigman & Mackauf advocate for our clients' full financial recovery through detailed, meticulous preparation for trial. If you have been injured in a bus accident, please Contact our firm to discuss your case. Our Bus Accident Lawyers obtained a $8,570 million verdict for a bicyclist who was struck by a MTA Bus. This verdict was listed 16th of the top 25 verdicts in New York in 2014 by the New York Law Journal. It was also listed in the 2015 New York Law Journal’s New York’s Verdict & Settlement Hall of Fame. Mr. Gair, my family and I greatly appreciate all of your work on my case. I was quite stressed about giving a deposition about what was a very tough moment in my life. Thankfully, your preparation, research and attention to detail were impeccable and I felt assured that I was in good hands. Thank you also for being so kind, understanding and supportive.